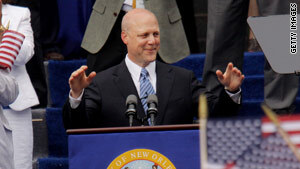 Mitch Landrieu was sworn in as mayor of New Orleans, Louisiana, on Monday. New Orleans, Louisiana (CNN) -- The new mayor of New Orleans has asked the Justice Department to review the city's embattled police department. In a letter sent Wednesday, Mayor Mitch Landrieu asked Attorney General Eric Holder to assign a team from the department's civil rights division to help the city address and prevent police misconduct. "I have inherited a police force that has been described by many as one of the worst police departments in the country," Landrieu says in the letter. "It is clear that nothing short of a complete transformation is necessary and essential to ensure safety for the citizens of New Orleans," it says. "The police force, the community, our citizens are desperate for positive change." Landrieu, the brother of Sen. Mary Landrieu, D-Louisiana, took office Monday and met with Justice Department officials Wednesday. A detailed plan for a partnership between federal officials and police is still in the works, mayor spokesman Ryan Berni said. On Thursday, Landrieu also announced he had tapped a new police superintendent, current Nashville Police Chief Ronal Serpas, to lead reforms. Landrieu said Serpas, a New Orleans native with a track record of reducing violent crime, was the candidate who was "best prepared to turn around the NOPD and start delivering results on day one." There are at least eight federal civil rights investigations of New Orleans Police Department officers, FBI Special Agent Sheila Thorne told CNN. She declined to provide further details because the investigations are ongoing. Federal prosecutors have investigated several New Orleans police officers involved in a shooting on the Danziger Bridge four days after Hurricane Katrina roared ashore in 2005. Two civilians were killed in that shooting -- a 19-year-old man and a severely disabled 40-year-old man. Four people were hurt. Four former city police officers pleaded guilty in federal court to charges relating to the shooting and to an alleged cover-up of the incident. Former officer Robert Barrios pleaded guilty in April to a charge he failed to report a cover-up. His plea came after guilty pleas from three other former New Orleans police officers: Michael Lohman, Jeffrey Lehrmann and Michael Hunter. The mayor said in his letter that most officers "honor their commitment to protect and serve each day," but an independent investigation must evaluate the department. "The force itself has been dealt a demoralizing blow with investigations, indictments and resignations stemming from incidents in the days following Hurricane Katrina," the mayor's letter says. Investigations of city police by the Justice Department are not uncommon, but cities themselves rarely initiate them, according to Merrick Bobb, executive director of the Police Assessment Resource Center in Los Angeles. Washington, D.C., officials took a similar approach in 1999 when they asked the Justice Department to investigate whether city police were using excessive force, he said. "I think it reflects very well on Mayor Landrieu that one of the first things he is doing is attending to the problems of the New Orleans Police Department, which for many years has been considered one of the most troubled police departments in the United States," he said. Working with federal officials will help close the "chapter of corruption" that has plagued police, said Melanie Talia, chief executive officer of the New Orleans Police and Justice Foundation. "Civil rights violations are not the norm, but they obviously have occurred. The Department of Justice will be here to help us weed those out and put an end to it," she said. Peter Scharf, a criminology professor at Tulane University who helped advise the mayor on his search for a new police superintendent, said officials must make significant cultural changes within the police department, including improving legal ethics and regaining the community's trust. "People are more afraid of the police than they are of the criminals, and we have really scary criminals," he said. More than a decade before Katrina hit, federal officials stepped in to investigate New Orleans police corruption in a wide-reaching probe that led to the arrest and prosecution of a dozen officers. A federal jury convicted former New Orleans police Officer Len Davis and sentenced him to death in 1996 for ordering a hit on a woman after she filed a civil rights complaint against him. Davis' arrest came after an undercover FBI operation, dubbed "Shattered Shield," which also revealed that police were extorting from drug dealers and engaging in other corrupt activities, according to an account on the website of the FBI's New Orleans division. A dozen officers were arrested and prosecuted after the investigation, and then-Chief of Police Richard Pennington worked to improve police ethics education with the Department of Justice, the FBI, the U.S. Marine Corps and the Louisiana State Police, the FBI website says. But Landrieu's letter said "malfeasance by members of the Police Department" has persisted. He told reporters in New Orleans that a partnership with the federal government fits with his goal of protecting city residents. "This is about examining patterns and practices, thinking about excessive force, dealing with internal affairs and basically to engage in what I would consider to be transformational, systemic reform," he said.